Precarious Workers’ Monument, 2015, performance. 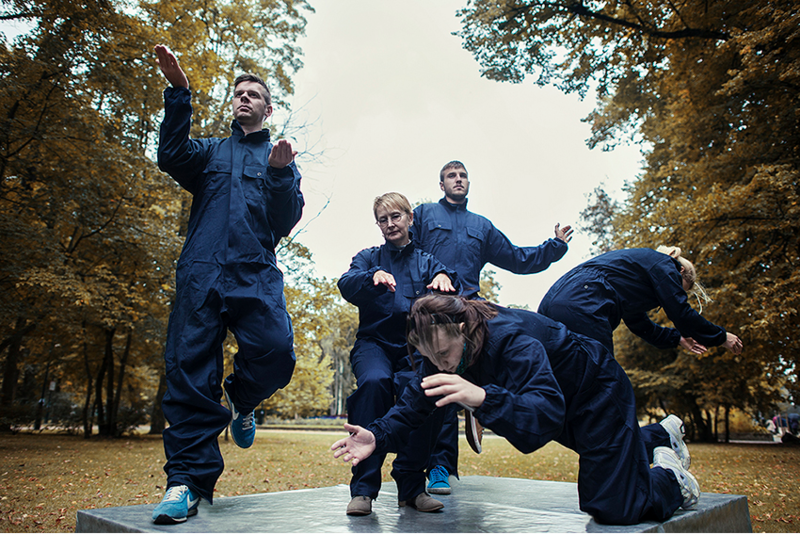 A public performance involving five precarious workers standing absolutely still in the same work-related poses for several hours thanks to a system of metal supports hidden under their clothes. Situated in a spa town popular with tourists, the work referred to both living statues, precarious work conditions in the businesses serving the local tourist industry and flexibility as the new bodily regime of late capitalism. Commissioned by Art Loop Festival, Sopot, Poland. Introducing Alicja Rogalska (b. 1979, Poland; lives and works in the UK), one of the artists participating in New Poetics of Labor 2018. Alicja Rogalska‘s practice encompasses both research and production with a focus on social structures and the political subtext of the everyday. The recurring subjects of her work are agency, body and affect especially in relation to issues such as class inequalities, global capitalism and international division of labour. She mostly creates deeply poetic and decisively political situations and performances, often in a specific context and in collaboration with others, which then become the material for videos and installations. These events and ephemeral moments are attempts to practice a different political reality here and now, create space for many voices to be heard and to co-exist, whilst collectively searching for emancipatory ideas for the future. Check out more of Rogalska’s work more here. Alicja Rogalska. Still from Dreamed Revolution (Wyśniona Rewolucja), 2014. Courtesy of the Artist. * Rogalska is also participating in NPoL 2018 with Łukasz Surowiec (b. 1985, Rzeszów)— In his objects and artistic interventions Łukasz Surowiec examines and investigates social relations, and also takes up political and historical issues. Important projects realized by the artist are Waiting Room (2013) and Spirit Level (2014). The purpose of his artistic interventions is to implement initiatives and strategies in response to social issues, with a special attention paid to marginalized people. As part of the Spojrzenia 2017 competition, he presented a collection of clothes and props (baseball bats, nicely packaged cobblestones, bottles for Molotov cocktails) inspired by anti-fascist combat tactics, complete with a distribution system, which consisted of exchanging the items for evidence of involvement in anti-system and anti-fascist protests.